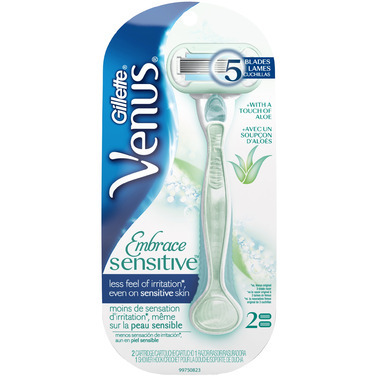 Gillette Venus Embrace Sensitive razor is a perfect match for sensitive skin. Venus Embrace Sensitive has 5-blades and 8X more glide enhancers for a closer shave with less irritation. * Try the #1 razor brand used by female dermatologists. Each package contains: 1 Embrace Sensitive Handle and 2 Razor Blade Refills. This razor leave the skin really soft and is easy to use around the knees or ankles. I like it so far! Really like this razor- shaves close and gently.